Hi everyone, all I can say is WOW! I never won anything of this caliber! 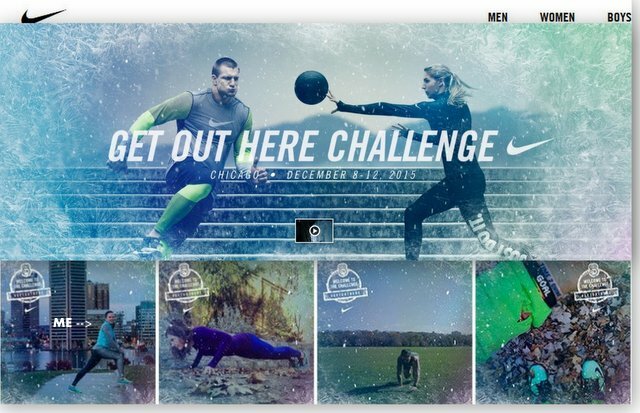 I was so stoked when I received the news that I am one of the 48 athletes who won a trip to Nike’s main event in the Get Out Here Challenge, taking place December 12 in Chicago, IL. I have yet to know what exactly that “main event” will be – still a mystery, but I have a good feeling it will have a brrr cold factor! I am also thrilled to share this experience with my W3Move teammate, Karen who was also selected! Thank you Nike – I am so blessed to have this amazing opportunity! Can’t wait! The “Snow Day” Campaign aired on October 29, Nike brought together 20 accomplished, professional athletes who were pitted against each other in one giant, snowy football game to remind everyday athletes across the country that training doesn’t end when the temperature drops. This is nothing. You should’ve been here in 2013! That was cold!